I found these bright, colorful, plastic party trays last year (I think at Michael’s but I cannot remember for sure 🙁 ). 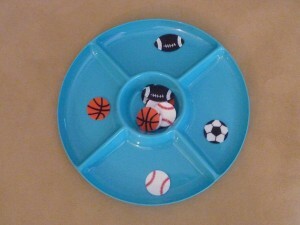 You can pair one of these trays with items like colored puffs, thematic felt stickers, goldfish crackers, buttons, beads, or anything that can be sorted by a specific characteristic (color, size, etc.) and you have an easy My Obstacle Course station activity. 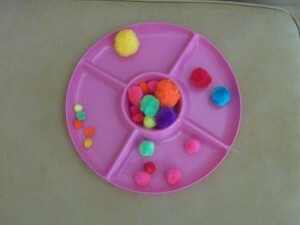 My Obstacle Course station activity: Sort puffs by color. 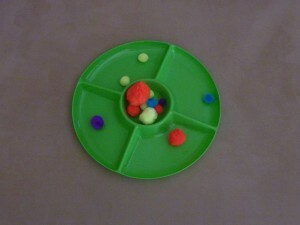 My Obstacle Course station activity: Sort puffs by size. 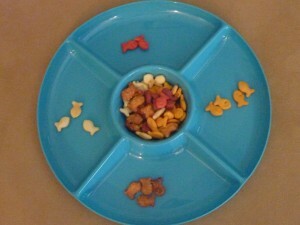 My Obstacle Course station activity: Sort Goldfish crackers by flavor. 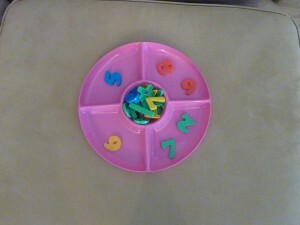 My Obstacle Course station activity: Sort the magnets by color. Obviously, you do not need these particular party trays. I am just showing how to use something that was colorful and inexpensive to create a fun, easy activity to build sorting skills.